Discover Amsterdam from the best located hotel in the city centre: located at the Famous Rembrandt Square, Amsterdam’s most popular bars, restaurants, clubs museums, galleries, theatres, cinemas, and shopping streets are right on your doorstep. Atlanta Hotel is a clean, friendly hotel and offers 3-starfacilities that will ensure a comfortable stay. The Dutch artist, Piet Mondrian, lived and painted here in the hotel between 1904 and 1907. The studio he rented was in the attic of this building, now room 33 of the Atlanta Hotel. 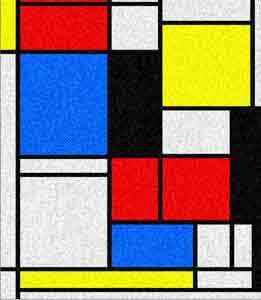 Mondrian was one of the founders of De Stijl. This group extended the principles of abstraction and simplification beyond painting and sculpture to architecture and graphic and industrial design. Mondrian’s essays on abstract art were published in the periodical De Stijl. Examples of his work and pictures of his studio can be seen on the Hotel walls. Tip: For Art lovers request the "Mondrian room", a special treat!